This past weekend was the January edition of Phantom Regiment's winter program. Once again, camp was a success, with major improvements made by all sections of the corps. On Saturday night, corps director Pat Seidling began his meeting with some special gifts for the corps. A while back, Phantom Regiment received a number of large boxes filled with old corps shirts, some of which dated back to the 1970s. Saturday night, a few members became proud owners of a few of these shirts. Seeing all of these vintage Regiment shirts reminded me of the shirt that I had found a couple years ago, and the incredible story behind it. Here, now, I relate this story to you. 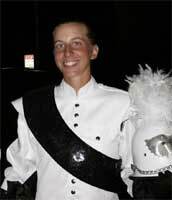 It was July 3, 2002, and I was halfway through my rookie year with the Phantom Regiment. We were staying at Boylan High School, rehearsing and preparing for our home show, the Show of Shows. This day was a laundry day for us, so after a morning rehearsal block we were bussed to a few Laundromats around Rockford in an attempt to make our clothes smell a little more tolerable. Once I had put my clothes in a dryer, I set off with a friend in search of some entertainment. We found it in the form of a goodwill store just down the street. There, we found a few other members already digging through the piles of clothing, in search of the perfect outfit. I set to work on the T-shirt racks, and before long, I had found it: A 1990 Phantom Regiment baritone line member T-shirt. Two minutes later and $1.25 lighter, it became mine. As word about my find spread throughout the corps, everyone came together with the same question: Who would ever get rid of a member shirt? Luckily for all of us, the 1990 baritone line section leader and designer of the T-shirt also happened to be in charge of the on-field instruction of the 2002 baritone line. It was here that I found out the story behind the shirt, and why the shirt is so important to me today. Back in 1990, the baritone line designed, ordered, and received their shirts while on tour, so that they could all wear their shirts before the summer was over. Although there were only 20 members in the line, they ordered 25 shirts in total. Their section leader asked the souvenir crew if they could store the extra shirts in the souvenir booth. She was granted permission, and all seemed right with the world. However, a few shows later, the horn line was warming up and she noticed something strange. Out in the audience, she saw a shirt that looked familiar -- a little too familiar. Yes, it was one of the member shirts! After the show, she asked the crew if they had sold one of the shirts, and to her horror, they said that they had. After all, the man asked for it, and they weren't about to turn down a sale. In order to assure that no more of the member shirts would be sold, she bought back the rest of the shirts, and held on to them herself for safe keeping. However, it was impossible to get that one shirt back. Impossible, that is, until I came across it in that goodwill store. Twelve years later, the shirt had returned to its home with the Phantom Regiment. I still think it's fitting that out of all of the members at the store, I was the one to find it. The shirt was designed by a blonde-haired and blue-eyed female baritone player, and found by a blonde-haired and blue-eyed female baritone player. In a corps that is steeped with tradition, I have decided to start a tradition of my own. Although female members are not unusual in the Phantom Regiment euphonium line, we are still very much in the minority. As a result, we form a special bond unlike any other corps friendship. We feel the same pain, the same frustration, and understand each other on a special level. This T-shirt will forever stay in the possession of a female euphonium player. I have held on to it for three years now, and at the end of this summer when I age out, I will pass it on to the next generation of female euphoniums. In 20 years, I hope to see this shirt still making its way across the United States, in the possession of a proud female member of the Phantom Regiment euphonium line. Tattered and torn, or in mint condition, I hope that the legacy of this shirt will live on for the future generations of female Phantom Regiment euphoniums. We write a special chapter in Phantom Regiment's history, and I hope that every passing season can add its own story to this ever-growing tale. Lanah Kopplin is a third-year euphonium player in the Phantom Regiment, and previously spent a year with the Pioneer. Lanah recently graduated from the University of Wisconsin (she's a Milwaukee native) with a political science degree, and will age out in 2005.